Lloyd of Gamebooks: YOU ARE THE HERO - KICKSTARTER! 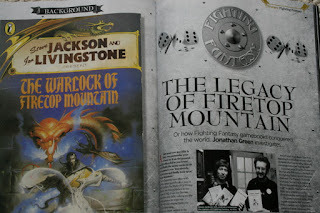 It's been a great year for Fighting Fantasy, but the goodness isn't over yet! Yes, we've had the 30th anniversary of Fighting Fantasy gamebooks this year, marked with the release of Blood of the Zombies in August where many adoring fans turned up to get their copies signed by Ian Livingstone. The creators of the well loved gamebook series were also present at Dragonmeet where they told us the story of how they brought Fighting Fantasy to us all. And it was a great story indeed. Jonathan Green, author of many a great Fighting Fantasy gamebook wants to tell this story and bind it into a book called YOU ARE THE HERO. To get this mighty tome off the ground, Jon requires £15000 to be raised. 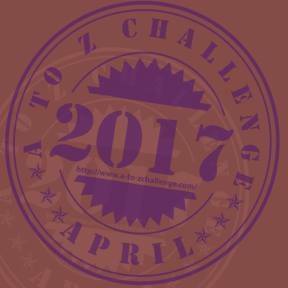 Things are going well, with almost £7000 raised at the time of writing. Well, this is the time when YOU ARE THE HERO and you can fund this excellent project. The rewards for funding this book are wonderful. 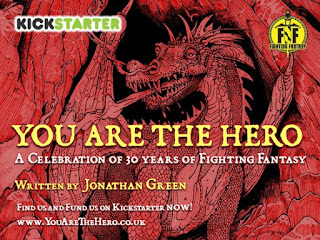 You can get a pdf of YOU ARE THE HERO if you fund £10, a hard copy for £25. For £30, you name will be in the acknowledgements part of the book - your name in a piece of FF history. 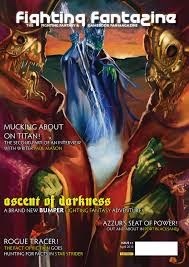 Other rewards include superb art prints, being interviewed for the book, and, if you have £500, having a lunch with Steve Jackson, Ian Livingstone and Jon Green. Now that is something to look forward to. I'm sold on the book - excited even - but the postage is going to prevent me from supporting the Kickstarter. Living in the "Rest of the World", £16 ($25.50 AUD) is a hefty price to pay to get the book, pushing the total price for a hardcopy up to $63 AUD. Sadly, I'll wait in the hope that copies end up on The Book Depository or AwesomeBooks.com, who offer free postage from the UK. @David, have you thought about having a chat with Jonathan and seeing if there's any way you can get a copy without having to pay so much postage? Thanks Matthew, I must confess asking Jonathan such a thing never entered my head. I would assume he has already investigated postage costs and worked out an average. I contributed to one Kickstarter which had cheap international postal rates only to receive an email on its completion asking for a donation of more money to cover the higher than expected postal rates. I naturally felt obliged to chip in, as the "right thing to do" and so ended up spending more than I would've had I known this up front. At least with this Kickstarter I know up front and appreciate the fact. I have found, however, that at times publishers don't always thoroughly investigate postal rates and so lose customers (Chaosium I'm looking at you). By publicly expressing disappointment sometimes changes are made for the better. And sometimes, sadly, there simply is no cheaper rate. Thanks too Matthew for pointing out your interview with Jonathan. I had seen it and meant to go back and read it. I have done so now and very much enjoyed the read.